The Acoustic Research AR-6 is one of AR´s less expensive models. Audio pioneer Edgar Villchur was behind the founding of speaker manufacturer Acoustic Research and the advent of its revolutionary “acoustic suspension” design. If you’re lucky enough to own a pair of Acoustic Research AR-6s, you probably already know that. But if you stumble across a used pair, it’s handy information to have. 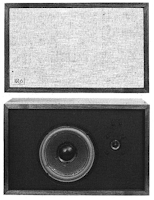 Edgar Villchur and Henry Kloss revolutionized speaker design in the mid-1950s with their groundbreaking design, which for the first time allowed deep, tight, controlled bass from a small bookshelf-sized cabinet. Acoustic Research speakers quickly gained favor among audiophiles and music lovers alike, and the company was famous for utilizing its state-of-the-art design and quality parts in all models, including the economically-priced and smaller AR-6. That’s why the background and history matter. Although the AR-6 was smaller than previous models, and sold for about $80 each new in the mid-1970s, it was not a compromise from the company’s larger models in terms of components, performance or quality. Pairs of AR-6s can be found today at very reasonable prices and are well-worth consideration by anyone wanting top-notch sound at an affordable price. In fact, like so many vintage speakers, they should be a first-choice consideration for newbies and novices who instead flock to big-box stores. Listen, if you find one. What you get is great bass. Nice, tight, controlled bass from a small enclosure. Even at the discounted price they sold for, these were not throwaway speakers. They are high quality loudspeakers that would fit nicely as a primary speaker in a small room, a secondary system, a bedroom outfit, a cabin – even a garage. Also, AR-6 speakers are nearly identical to the AR-4xa (click here for a review of the AR-4xa) with two exceptions.The woofer resonance of the AR-4xa is 65Hz in enclosure, vs. the 56 Hz of the AR-6. The second difference is the cabinet form. The AR-6 is slightly higher and wider, but 2 inches less deep. Like other acoustic suspension designs, the downside of this speaker is their high desire for power. But don’t let that scare you away. Power was at a price-point premium when they debuted in the mid-1970s. These days most any low-priced solid-state receiver or amplifier will drive them nicely. But if you want the best – a true, classic sound to impress friends and family – find a high-powered vintage receiver to drive them. Then hook up a turntable and settle into music like it was meant to sound. But there can be a few issues with the AR-6, mostly resulting from its age. Primary among the challenges are the foam surrounds, which wear out. 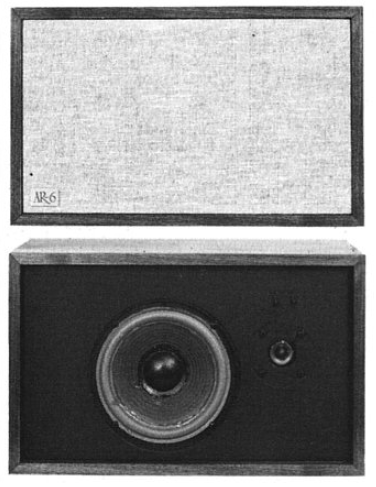 This is not unique to Acoustic Research or the AR-6 – any vintage speaker will need the surrounds replaced, which are of vital importance to sound quality, especially in an acoustic-suspension model. Luckily, replacement kits are readily available and affordable, with most going for around $30 for a pair. A novice with a steady hand and a set of instructions can easily handle this task, which is explained in more detail here. Besides the surrounds, cabinet condition is likely to be the only other major challenge. Old AR-6s that have spent too many years in basements or garages may need refinishing – another task described on this site that is readily tackled by anyone with basic skills. 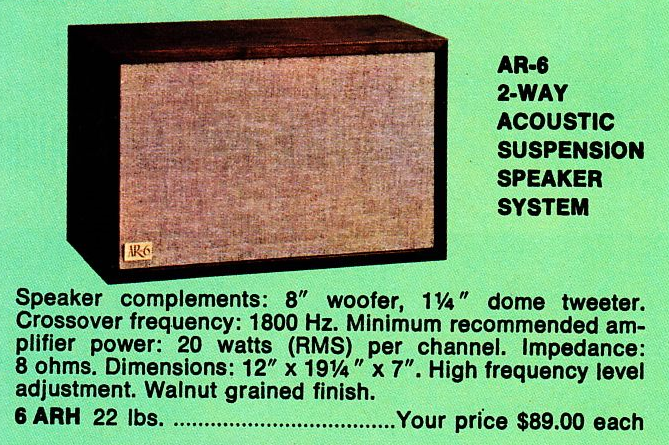 If you are planning to get into restoring an AR-6, read our restoration articles: Restoring Veneer , Sealing and Protecting old Speakers and Refoaming . AR-6 Price: $150+ in good condition up to $350. Not Kloss,but Edgar Villchur invented the Acoustic Suspension!! Kloss was Villchur's student at that time. Its a shame kloss gets always the credits.. Thanks, the information! It is not easy to keep all the information completely accurate, so comments like yours are very welcome. Just found a set of these by the side of the road. Thanks for the detailed review! Cherish them.. I traded a pair for bulky Technics SB-5000 (which still do the job).